Track discounted Mac and iOS apps. Is there a better alternative to AppyDays? Is AppyDays really the best app in Reference category? Will AppyDays work good on macOS 10.13.4? AppyDays ensures that you will never miss out on discounted apps again! 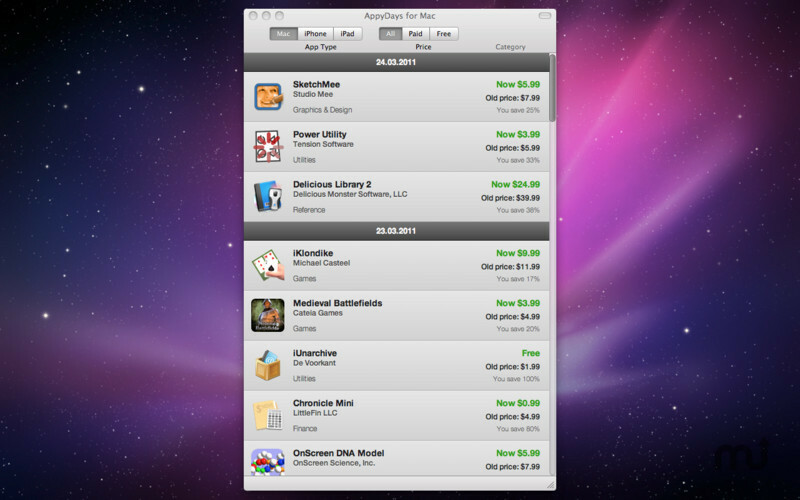 AppyDays for Mac gives you an unbeatable quick, simple and extremely current overview of discounted Mac or iOS-Apps. And to allow even more flexibility, you can even choose between categories or prices. Interested in an app? Just click it and you will be immediately redirected to the Mac App Store or iTunes. It really doesn't get any more convenient!